Mom: Meredith! You have to watch Oprah tomorrow! It's the Thriftiest Family In America! Me: If it's the Economides family, I already read that book. Mom: No! This family only spends $5 a month for cell phone service. Me: That's what I've been paying for a couple of years now. Mom, we have offered to get you a prepaid Tracfone a hundred times! Mom: And they save hundreds of dollars by cutting their own hair. Mom: Well, I just thought you could get some tips for your Internet. It's actually a decent episode re-airing Tuesday. We just might learn something. "Tips for your Internet"... Love it. :-) Sounds like something my Nana would call and say. LOL! I'll watch - you never know. But most of the time it's stuff I'm already doing. 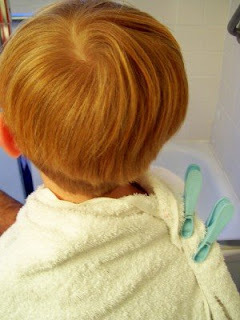 I've tried the at home haircuts a few times myself...ot always a raging success, but I only had to take one kid in for a correction:) The Tightwad Gazette makes it look so easy, huh? Andrew's hair is SO hard to cut. I got tired of paying someone else to mess it up; it's just as easy to mess it up at home, free. She's sweet! And you were gracious! Ha! Your mom sounds like my mom. I don't think they always "get" how thrifty we are :) That made me laugh! Are we becoming a seen that, done it, heard it, doing it kind of frugal people now? Have we hit the end of our frugal ropes yet? It sometimes can be difficult to feign the same enthusiasm as I used to in the beginning and I worry about that sometimes as I want to encourage anyone wherever they are in their frugal journey. So hard! 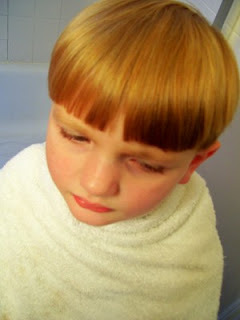 I used to cut my own kids' hair, but after I butchered it so many times, I started taking them to the salon. Thankfully, my friend only charges me $5 to cut their hair!! Thanks for that Oprah link. There is some good stuff there. HILARIOUS, they always say your family keeps ya humble. I just cut my sons hair last week - well and each day after, just needed a few adjustments. I know what you mean! My children are all grown now, and the oldest grandchild is 18, and we still practice frugality. I used to read articles and think "I didn't learn a thing! I should write articles.". That was the day before internet, and most of the time we didn't own a TV, but I did splurge for women's magazines now and then. I always cut my two sons' and my husband's hair. They didn't get professional haircuts until they were out of highschool. I still cut my husband's. Saves a good deal of money. Now if he could only cut mine. Not! I am curious to watch it - to compare how thrift I am :) Maybe I could be classified as the 2nd most thrifty (or 222nd most thrifty) family in the USA. I know we could be thriftier - but I don't think it's necessary to be thrifty to the point of deprivation and starkness...at least not at this point in our lives. Your conversation cracked me up, especially as I'm like you ($5/month cell phones, but no at-home haircuts). I fed 10 people this weekend for about $12, dessert and drinks included. I do appreciate the head's up, as it sounds like something interesting to watch while I iron this afternoon. In order to save money by cutting things out you have to have been spending money on those things all along. For instance, I have always cut my kids hair. I didn't pay someone for years and years and then suddenly start saving $50 a month on haircuts, ya know? All the experts act like I am saving extra money by doing it. Really I am just not spending the money. I finally bit the frugal bullet and started cutting our hair and wow, I'm honestly good at it. I had no idea. And it's free. :) It took me 7 years of frugal living to attempt it, but hey, it was worth the wait. I will still pay to have mine cut 2X a year or so when greatclips has a sale, or when my friend offers me free haircuts in exchange for babysitting for her. That's a can-do. I'm sorry but I totally think you and Crytal (Money Saving Mom) beat the Economides (and probably that other family on Oprah)! I've tried ad matching at Wal-Mart but it isn't worth my time, if I shopped there once a month and matched every item I bought I would literally be there all day. I don't know how the Economides do it. Their cashiers must know how to process the ad matches and trust them on the prices (I always seem to get cashiers that don't know what they're doing and want to see every single ad item). Ugh! My husband started cutting his own hair before we got married, when a "professional" hairdresser butchered his so badly that he had to buy a pair of clippers to fix it himself. He figured he couldn't do any worse than that and the clippers were cheaper than the haircut in the first place. He hasn't had anyone else (except me from time to time) cut it since- at least 10 years now. The Oprah show wasn't that enlightening. I get much more helpful info from frugal mamas on the web like you, Crystal@Money Saving Mom, and Jennifer@Getting Ahead! I'm too scared to attempt cutting my son's hair, but I do my daughters' hair all of the time. I agree that those of us who are already frugal have a hard time learning more frugal tips from shows like Oprah, lists in magazines, etc. Oh, well. Bwahahahaha! That is way too funny! Love it!